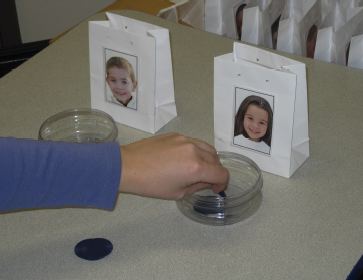 In this study, children had toy coins to distribute to pairs of unfamiliar children (depicted in photographs). The people in the photos were from different social categories. For example, sometimes the children saw a boy and a girl, and sometimes they saw people from different racial or ethnic groups. We were interested in whether children would use these social categories when deciding how many coins to give to each person. We also wanted to know why children might use social categories when deciding how to share the toy coins. One idea is that children share more with people they like. Another idea is that children share more with certain people because they expect those people will share with them. To test these possibilities, children in the study were asked how much they like the people from different social categories, as well as how generous different people might be. We found that preschoolers gave more resources to members of their in-group than to member of out-groups, mirroring findings from studies of older children and adults. For more information about this research, contact Dr. Kristin Shutts, Living Laboratory collaborator and Director of the Social Kids Lab at University of Wisconsin-Madison. Many children's exhibitions feature a reading area, or parent resource room, with a variety of children's books. Whether at the museum or at home, books can serve as a starting point for discussion about both the similarities and differences among all people (some examples include: Whoever You Are by Mem Fox and The Skin You Live In by Michael Tyler). There are also many children's books that talk about sharing (for example: The Doorbell Rang by Pat Hutchins and The Mitten Tree by Candace Christiansen). Watch the ways in which your child interacts with siblings and friends. Do you see your child sharing snacks, toys and other resources with you and other members of the family? When your child and a peer want to play with the same toy, do they cooperate and play together, or choose to trade off and take turns? If they choose to take turns, do they trade toys after they’ve played? If you have kids of different ages in your house, what do you notice about differences in their behavior?